Marvelous Multiagers! : Head, Thorax, Abdomen! Today we took a little detour from our normal course of action. My cousin, Kelley, is going to school to be a teacher and she came in and taught a lesson to my class! She is in a crazy class called Insects and People, and for her final project she had to either write a ridiculous paper, rear an insect, or teach a lesson about insects. Clearly she picked the best option. :) So today my class learned about bees! I definitely did not take pictures of everything... but she had the kids make a black and yellow foldable about bees. One page was about the life cycle of a bee. 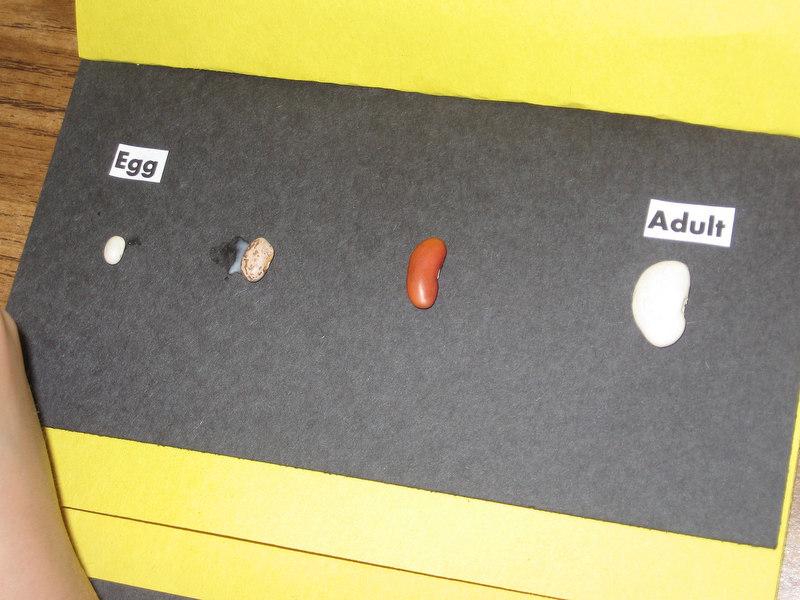 This isn't the finished page, but each bean stood for a stage of the life cycle. Underneath the beans, the kids glued a little piece of paper that said how many days the bee stays in that stage. There were also pages about types of bees and body parts of bees! We also used a page from Reagan's Gone Buggy Unit! Part of our super fun day was learning a song about an insect's body parts. I took a little video in case you've never sung this song before. My class LOVED it and sang it all day. Later, we resumed our normal science unit and learned why fossils are important. We had a special conversation about extinction to make sure we knew that when something dies, it isn't necessarily extinct. We put together these little fossil puzzles to help us understand that fossils give us clues about plants and animals because the fossils LOOK like the plant or animal that they came from! I would give this to you... but it came from my science Teacher Activity Guide! I actually ordered this over the weekend because I don't have any of the supplemental stuff for my science program... only the kid books and my teacher's manual. And I had to ask my principal to buy the teacher's manual for me! But the guide was well worth the $4 I paid for it because they really liked this activity and it helped them understand different types of fossils and the type of work that paleontologists do. And that class sounds nuts! Rear an insect - lol. I would've chosen the lesson, too. Is Insects and People the actual name of the class?! That's hilarious! The class is called Insects and People. It's one of the Integrative Biology options to choose from, since I am finishing up my general science endorsement this semester. The class is incredibly fascinating, and I've been getting a lot of great ideas for teaching in the future, since I think insects is a topic many teachers don't want to teach...I don't blame them. I'm still getting over my fear! Thank you again for letting me take over for an hour!!! I hope they took at least a few things away from the lesson :) I can't wait to come back in May!